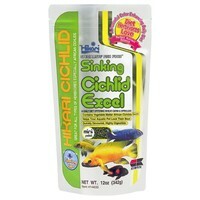 Hikari Cichlid Excel Sinking Mini is a daily diet recommended for all types of herbivorous cichlids and large tropical fish who respond well to a diet that is rich in vegetable matter. This Cichlid excel food contains the perfect balance of natural ingredients to meet the nutritional demands of your fish. The use of the inner most portion of the wheat germ kernel offers incredibly rapid digestion and contains the beneficial nutrients your freshwater herbivores require. Even the pickiest of eaters will adore this premium quality fish food which is extremely nutritious, easy to digest, provides powerful colour enhancement and promotes brilliant growth characteristics. Feed your fish the amount of food they would usually consume in a few minutes, 2-3 times daily. Take care to avoid over feeding and always make sure that you remove uneaten food after the feeding period.